You must first register with ReferDigital as a partner to apply to this merchant. Approved holders of ReferDigital partner accounts may then apply to partner with any merchant on the ReferDigital network. To sign up for a ReferDigital partner account, click here. When your application is approved, login to ReferDigital and return to this page to apply to this merchant. If you already have a ReferDigital partner account you should click here to login, then return to this page to apply to this merchant. Tip: Applying to this merchant as a partner will allow you to promote them via affiliate marketing (if they have an affiliate marketing program) and/or purchase their products wholesale/dropship (if they have a wholesale/dropship program). 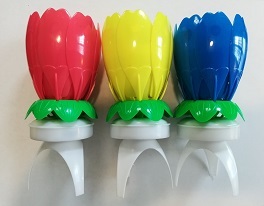 Lotus Candles open up like flowers and light up, rotate, and play the Happy Birthday tune! Birthday parties will never be the same again! If you run a restaurant, bakery, party business, retail store selling gifts/novelties/birthday party supplies/birthday cakes, or similar kind of business, we offer wholesale pricing on Lotus Candles. Your customers will love them! And you buy them right here online through our Lotus Candles wholesale store on ReferDigital, with fast free USPS priority shipping on all wholesale orders. You must be able to show your sales tax ID certificate, state reseller certificate, or similar state-issued official document to prove you will be buying for resale. Please make sure a copy of this is in your partner profile on ReferDigital. Please also make sure you have enough information in your profile for us to understand your business - things like business address, how long in business, pictures of your business, website link, etc. Your business MUST be based in the USA. If approved, please note that we sell wholesale in packs of 24. So our minimum wholesale order is a pack of 24 candles. You can also order wholesale by the carton if you have larger requirements (1 carton = 100 candles of a single color, minimum order is 3 cartons). To place carton orders, please email us for further instructions. For select ecommerce retailers, we offer dropshipping of Lotus Candles straight to your customers for a great price. You can place orders to be dropshipped right here on the ReferDigital platform. We are primarily looking for partners such as online party supply stores that want to include our candles in their product offering, although we consider each application on a case-by-case basis. As for wholesale, make sure you complete a detailed profile on ReferDigital before applying so we can fully understand your business, including a link to your online store where you plan to sell our products, as well as a description of your marketing strategy and customer base. Your business MUST be based in the USA. If you don't have your own online store but wish to sell Lotus Candles online, you can even set up your own personalized Lotus Candles online store through the ReferDigital platform! All orders placed in that store will be dropshipped by us automatically. LotusCandles.com has an affiliate program on ReferDigital through which you can become our partner and earn generous commissions for referring us new customers! With affiliate marketing, you link to our online store via the affiliate tracking links we provide, and all orders are completed there. We are looking for affiliate partners such as established websites and social media accounts which can promote our candles to their audiences. Please note that your audience MUST be based in the USA since that is the only place we can fulfill orders. Make sure you have a completed ReferDigital profile describing your business before applying to partner with us. Last active on Apr 15th, 2019. Mar 7th, 2019: Lotus Candles posted a campaign on ReferDigital. See campaign Shopping Cart Campaign (Test). Sep 4th, 2018: Lotus Candles posted a campaign on ReferDigital. See campaign Order Page Landing. Sep 4th, 2018: Lotus Candles edited a campaign on ReferDigital. See campaign New Customer. Sep 3rd, 2018: Lotus Candles edited a campaign on ReferDigital. See campaign New Customer. Sep 3rd, 2018: Lotus Candles posted/edited a product on ReferDigital. The product's name is Red+Yellow+Blue Lotus Candles 3-Pack. Sep 3rd, 2018: Lotus Candles posted/edited a product on ReferDigital. The product's name is Pink+Yellow+Blue Lotus Candles 3-Pack. Sep 3rd, 2018: Lotus Candles posted/edited a product on ReferDigital. 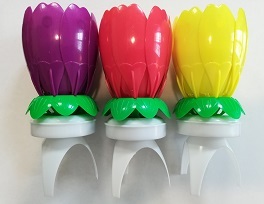 The product's name is Red+Yellow+Purple Lotus Candles 3-Pack. Sep 3rd, 2018: Lotus Candles posted/edited a product on ReferDigital. The product's name is Red+White+Blue Lotus Candles 3-Pack. Jul 4th, 2018: Lotus Candles posted/edited a product on ReferDigital. 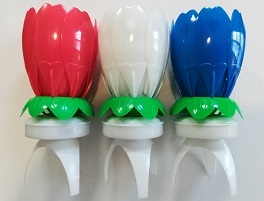 The product's name is Red+White+Blue Lotus Candles 3-Pack. Jun 19th, 2018: Lotus Candles deactivated a campaign on ReferDigital. See campaign Lotus Candles Subscription.